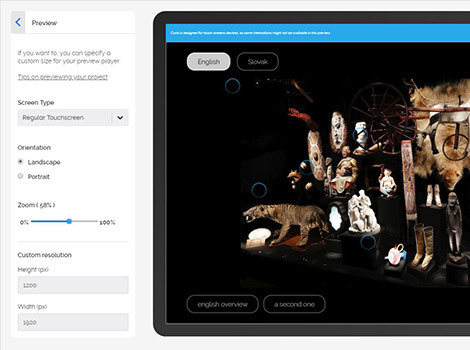 Curio is an online publishing platform that lets Museums, Galleries, Libraries, etc make their own digital interactives, without needing specialist suppliers. Curio is especially suited to creating object-based interactives, typically presented on a touchscreen. All you need is an object, or a collection of objects, and some stories to tell about it that will fascinate your visitor. If you have those, then you're ready to start! Curio is free to try and you’ll need to buy a license to publish the interactive to a screen, so you can check it and so your visitors can start interacting. After that, you can monitor how successful it is and make changes as often as you like. The hero image will be the face of your interactive. It is usually an image of the object, or group of objects, a painting, document or map, that is the subject of your interactive. It is best if it is a high resolution image so that the visitor can zoom right in on the detail and take a closer look. Select the parts of your object that have the most interesting stories. These are your highlights. Next, add a story to each highlight. We recommend recording audio - because visitors love listening to a curator, artist, descendants, or other expert sharing their knowledge and stories in their own voice. You can also add text, video and/or other images, to further help tell the story. You can customise your interactive by changing fonts and colours to suit your exhibition or organisation. We've written some tips to guide you in what's possible with this feature. Your interactive starts out using our default (Curio) theme, but you can change it to suit your brand. Curio also allows you to create and save several different themes (e.g. different themes for different exhibitions). If you have invited others in your organisation to join your Curio account then they can also share any themes you have made. In addition to specific highlights, you can also add overviews for any contextual information. These could be information about the time period the object comes from, or it could be another perspective, another language, or even completely different media like a poem or song that relates to the object. Overviews should only be added if the information cannot be told with a highlight. This feature lets you get an idea of what the visitor will see. The very best way to experience the interactive as the visitor will encounter it, is to publish it out to the screen you’ll be using in the gallery. That's where you can check your font size, the layout and volume of content, etc. Publish the interactive onto the screen visitors will use it on. You’ll need to buy a license for your organisation to publish the interactive. The licence you choose depends on how many interactives you want "live" at one time. Once you register a screen to publish to, we’ll email you a link to download a player that goes on that screen (or the computer that controls it). The player will also give you a code to enter, and then your interactive will be published to that screen. You can then update the interactive at any time. A screen only needs to be set up once with the Curio player on it. It will always be available for you to publish to, as long as your licence is current. Our fabulous analytics mean you can see at a glance which stories are the most popular, which media is most accessed and how long people are engaged for. If you see a “hot” area on the heat map - then that’s where people are mostly zooming in or clicking. No story there? Perhaps you should add one.